Another birthday post! So, as I mentioned in my Sarah's Birth Month post, I managed to squeeze in an extra birthday meal - a birthday degustation at The Grand Hotel, in Richmond. You may remember I attended their Italian Yum Cha (on an invite) back in November and loved it, so I was looking forward to visiting again! Here's the deal with the birthday degustation - if you sign up to be a Grand VIP (i.e. if you sign up to their email list), you can get a free six-course degustation on your birthday, normally priced at $85. You have to bring at least one paying customer with you, and there's only one free birthday dinner per table. It's a pretty great deal if you ask me! 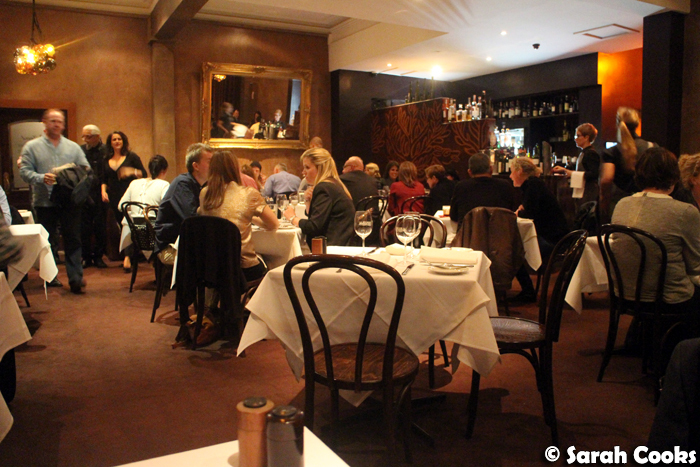 When we arrived for our booking on a Friday night, the dining room was pleasantly buzzing. 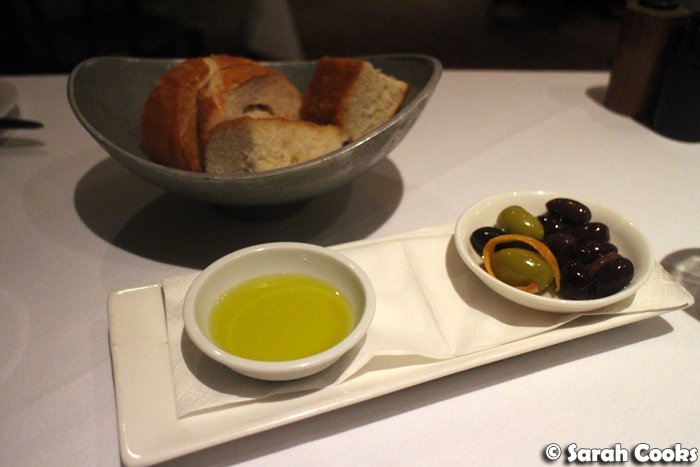 We started with warm bread, olives and olive oil. Our first course was a lovely mixture of buffalo mozzarella, yellow tomatoes and candied beetroot. 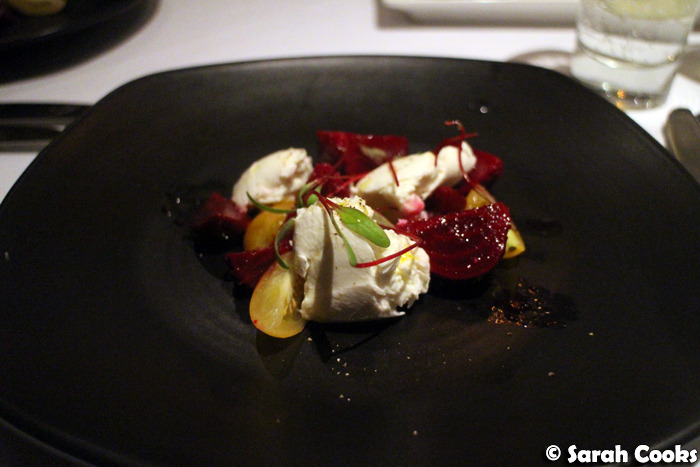 I loved the contrast of milky, creamy mozzarella and sharp-sweet tomatoes and beetroot. I'd informed the restaurant of Sandra's dietary requirements (no seafood, well-done meat only) when I made our booking, so for the next two courses, they kindly did a different option for her. 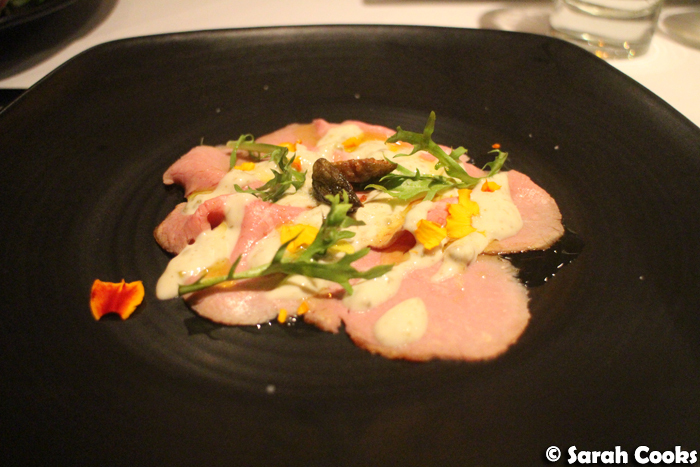 My second course was a classic vitello tonnato - poached slices of veal with tuna mayonnaise and caper berries. This isn't the type of dish I would think to order normally, but I enjoyed the combination of tender slices of meat and sharp, salty mayonnaise. 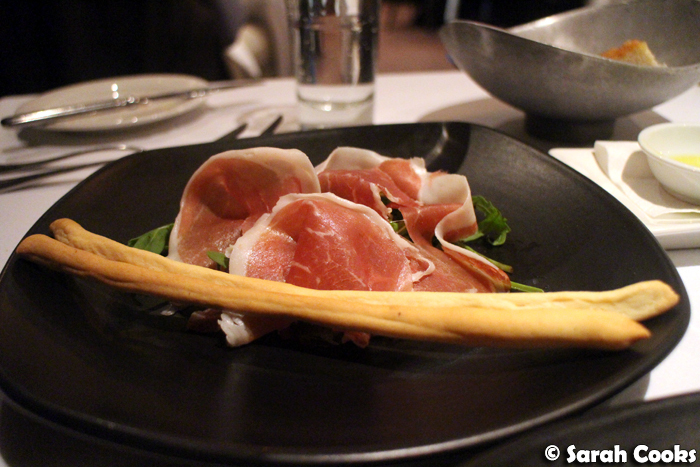 Non-seafood eater Sandra's second course was a plate of prosciutto with grissini - simple and delicious. 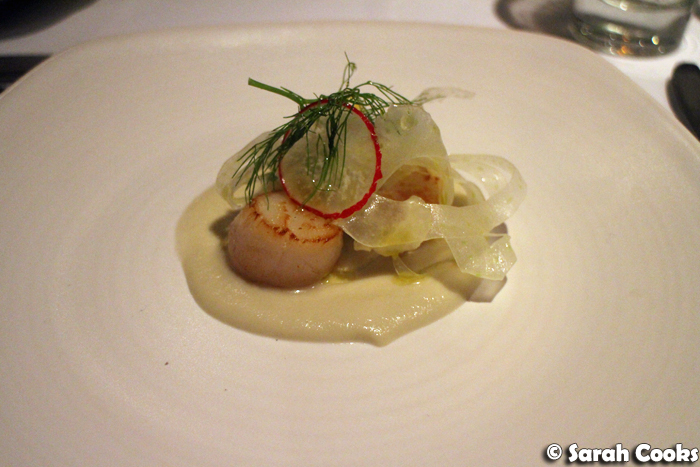 The third course was a scallop dish, topped with thinly shaved fennel and radish. Sadly I can't remember what the purée was (potato? celeriac? ), but I remember that I really enjoyed this dish - the scallops were perfectly cooked, and the contrasting sharpness of the fennel was very appealling. 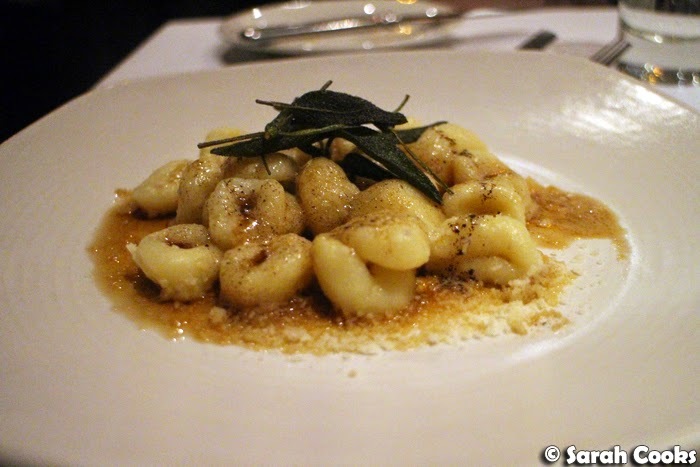 Sandra's veggo dish was by no means a consolation prize - it was a big plate of their fabulous gnocchi with burnt butter and crispy fried sage. I'm so glad they included this in the degustation, because we had it at the Italian Yum Cha and it was literally the best dish out of all the many different things we ate that day. I'm even more glad that the portion was so generous - Sandra couldn't finish the plate, which meant I got to! And yes, I mopped up all of that delicious burnt butter with bread. I regret nothing! 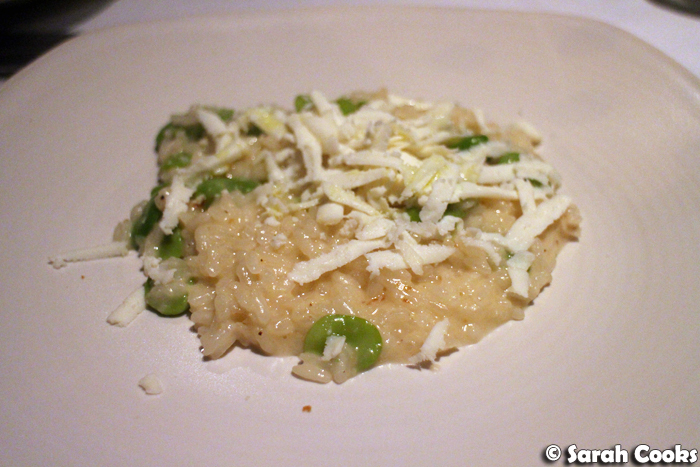 Our fourth course was the same for both of us (as were the remaining courses, actually) - a simple and tasty broad bean risotto. 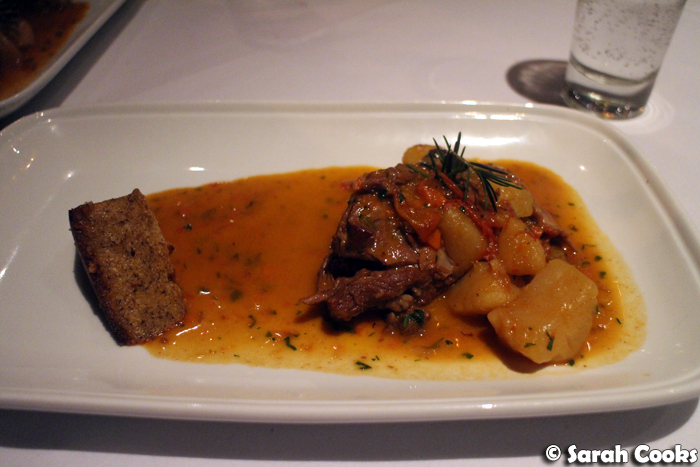 The fifth and final savoury course was capretto in umido - a goat stew with potatoes, olives, and crispy polenta. We were surprised they included such an unusual meat in a set menu - Sandra wasn't a huge fan, but I liked it! The meat was quiet gamey, cooked until very tender, whilst the sauce was richly flavoured and herbaceous. I also appreciated the generous amount of potatoes. It was a very hearty, comforting dish. We were very full by this stage, but were happy to eat dessert! 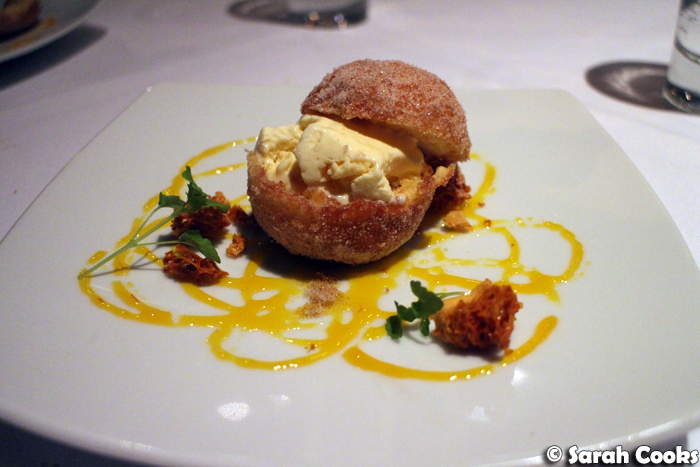 In this case it was a bombolini (is that bombolino in singular?) with crema pasticceria and honeycomb. It was a nice way to end the meal. So that was The Grand's Birthday Degustation! There was lots of food, and overall it was very good. I also enjoyed the atmosphere and thought the staff were great - from what I could see, the team is extremely competent and slick, and the staff who served us struck a good balance between friendly and professional. In terms of price, with the birthday freebie, we paid just $116.50 for the two six-course meals, plus a glass of wine and a bottle of sparkling water, which is an excellent deal. (Matching wines are available at $55 a head - I was tempted, but realistically I know that more than one glass of wine on a Friday night and I'd fall right asleep!) I believe the degustation is available on Tuesday nights for non-birthday people too, so you don't have to wait until your birthday to try it out. Way to do a birthday in style!